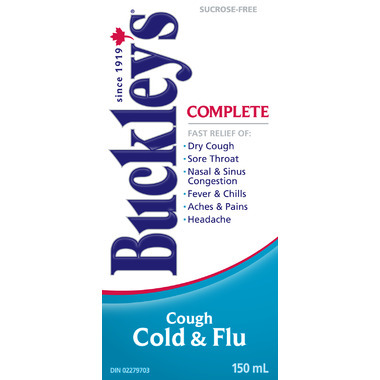 Buckley’s Complete Syrup 150mL gives cold and flu symptoms a taste of their own medicine. Get fast-acting all-in-one relief from dry cough, sore throat pain, fever and chills, nasal and sinus congestion, headache, and minor aches and pains. To be sure this product is right for you please read and follow the label. Directions: ADULT USE ONLY. Adults and children over 12 years old: 1 to 2 teaspoons (5 to 10mL). Do not exceed a maximum of 6 doses daily. Children under 12: Do not use. Non-Medicinal Ingredients: Ammonium carbonate, butylparaben, camphor, Canada balsam, caramel, glycerin, menthol, pine needle oil, polyethlene glycol, propylparaben, sodium cyclamate, tincture of capsicum, viscarin, water. Contains Acetaminophen and other ingredients. This package contains enough drug to seriously harm a child. Keep out of reach of children. WARNING: ADULT USE ONLY. DO NOT USE with other drugs containing acetaminophen, other cough/cold medications; if allergic to acetaminophen or any other ingredients. If you are not sure whether a drug contains acetaminophen, ask a doctor or pharmacist. Liver warning: This product contains acetaminophen. Maximum of 60 mL (3900 mg) in 24 hours. Severe or possibly fatal liver damage may occur if you take: more than the recommended dose in 24 hours; with other drugs containing acetaminophen; while drinking three (3) or more alcoholic drinks every day. Symptoms of liver damage may include: yellowing of skin/eyes, dark urine; sweating, nausea, vomiting, stomach pain; unusual tiredness, and/or loss of appetite. Ask a doctor or pharmacist before use if you: are pregnant or breastfeeding; have kidney or liver disease; have a persistent or chronic cough, difficulty breathing, asthma or other chronic lung conditions; or are taking warfarin-containing blood thinning drugs. Allergy alert: acetaminophen may cause serious skin reactions. Symptoms may include skin reddening, blisters, rash. If these symptoms occur, stop use and seek medical help right away. Stop use and ask a doctor if: Pain lasts more than 5 days; fever lasts more than 3 days; sore throat more than 2 days; if symptoms worsen or are accompanied by a high fever (>38 °C), persistent headaches, or the production of thick yellow/green phlegm. In Case of Overdose: Call a doctor or Poison Control Centre immediately, even if you do not notice any signs or symptoms. Store at room temperature. Security Feature: Do not use if sealed carton ends are broken or torn.